Like the original Love Glove, the Love Glove for Cats removes dead unwanted hair while gently massaging/petting the cat. The massaging/petting leaves the cat clean and free of mats and tangles. 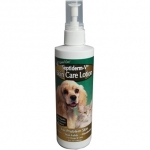 GreenTree Septiderm-V Skin and Coat Lotion is for dogs, cats and horses over six weeks of age. Septiderm-V Lotion is a soothing, non-greasy lotion.